One of the best things about summer is the abundance of fruit and vegetables in season. Sure with global commerce we can get almost any produce item at any time of the year, but there are a few things that just taste better in summer, asparagus being one of them. 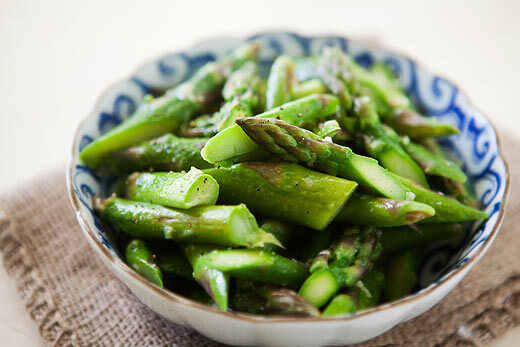 Asparagus added to any meal just makes it taste fresher, healthier and more delicious. Asparagus is the super hero of vegetables. In their long, thin body is a ton of health benefits including fiber, folate and vitamins A, C, E and K.
Asparagus is also a great source of glutathione. Glutathione contains three amino acids (glumatic acid, glycine and cysteine) that combine into one molecule that serves as a powerful oxidation-reduction agent in our bodies. So by eating asparagus not only are you fighting free radicals and the aging process, but you are also protecting yourself against many forms of cancer including bone, breast, colon, larynx and lung. Asparagus also contains the amino acid asparagine. Asparagine is a natural diuretic that is used to treat swelling, arthritis, rheumatism, and PMS-related water retention. For only 43 calories per cup asparagus contains all these powerful nutrients as well as over 11% of the Recommended Daily Allowance of dietary fiber and almost 10% of our daily requirement of protein. You can find asparagus all year around but the prime season is February to July. When picking out your asparagus look for firm, straight, smooth, rich green stalks with tightly-closed tips. Ridges in the stems and a dull green color are an indication of old age. The stalks should not be limp or dry at the cut. Asparagus is pretty low-maintenance; you don’t need to wash asparagus before you store it, and you definitely don’t want to soak it. Simply trim the ends and stand them upright in a jar with about an inch of water in the bottom. Cover with a plastic bag and store spears in the refrigerator for up to two days. The most important thing to remember is to always keep your asparagus clean, cold and covered. Asparagus can be eaten raw, steamed, sauteed, baked and even pickled but in the spirit of summer and summer cooking, try this easy recipe for grilled asparagus. Remove from grill, serve and enjoy.